The last of my San Francisco photos, and my favorite one from the trip. I had seen her walking along Fillmore but had been stricken by a sudden bout of shyness, and let the opportunity to photograph her pass me by. But then I saw her again in Crossroads, and when I asked if I could take her photo, she was so wonderful about it, and said of course I could. 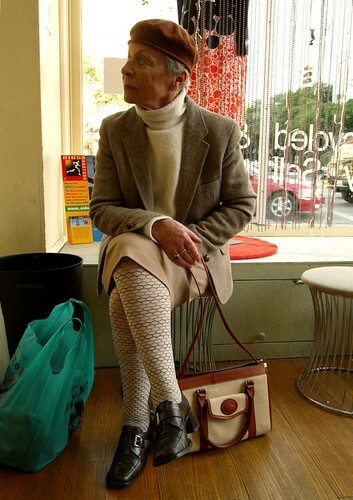 I love everything about her look, especially the jaunty beret and patterned stockings, and she said it was all vintage. I can only hope to be so stylish someday. this picture is priceless :) this lady has so much character... great shot! how chic! love her bag. great pose. hi styleclicker - thanks for the link; great site!